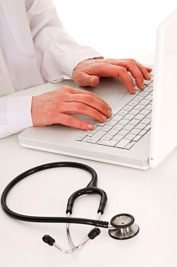 EHR implementation has the potential to affect a transformational change to your practice. Workflow is streamlined, errors and inefficiencies are greatly reduced, and increased revenue is generated when an integrated approach is utilized that combines the humanity of the healthcare industry with the power of technology. The key to success is to establish a partnership with an organization having a reputation as an industry leader. Healthcare Information Services, LLC has the ability to work with your practice to ensure that your EHR implementation provides you the maximum return on your investment. HIS technology experts begin by identifying the right hardware for your practice's requirements. Hardware is the foundation of your system, and putting the right hardware in place means state of the art security, speed, and accessibility for your practice's system, allowing you to share information with other healthcare professionals, payers and providers without worrying about HIPAA violations, viruses and system security breaches due to hacking. Most importantly, your IT infrastructure must be compatible with your EHR hardware. HIS utilizes networking experts who will partner with you to achieve the optimal results from your EHR implementation. HIS project managers will work directly with your physicians to discover the unique needs and challenges of your practice, selecting the optimal hardware for your business. Too much or too little hardware is problematic; too much and you lose revenue due to under-utilization. Too little hardware and you run the risk of system failure due to overload, resulting in problems ranging from loss of service to breach of security. The right hardware ensures that your EHR implementation has the foundation it requires to meet (and hopefully) exceed the needs and expectations of your practice.